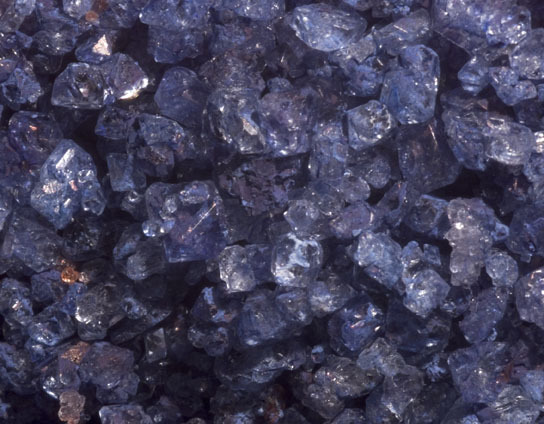 Crystals are solid substances in which the smallest units are arranged in repeating geometrical patterns. 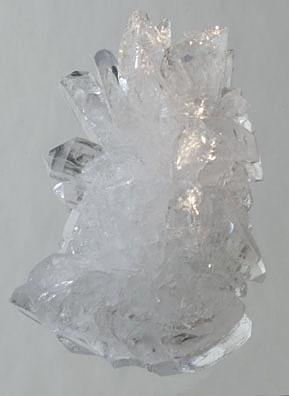 Crystals have attracted people to them because of their beauty and some believe in their magical or medicinal powers. 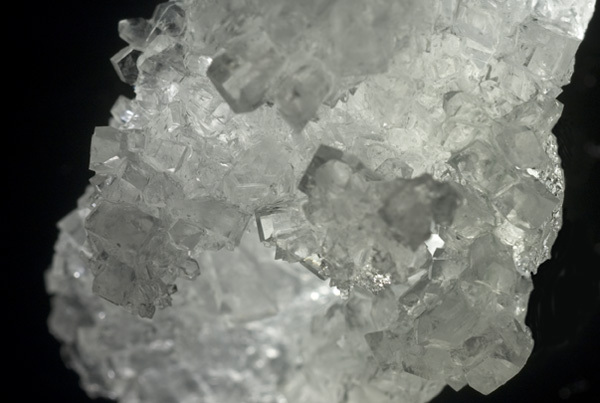 Although normally it takes extreme heat and pressure and perhaps thousands of years for crystals to grow in their natural state, you can grow crystals in your own home in a short amount of time. 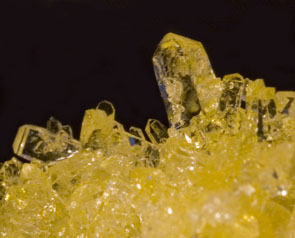 The two crystals I grew were alum and sugar crystals. 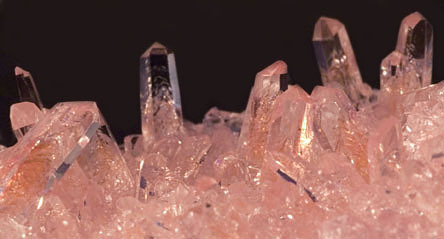 Growing crystals at home was suprisingly easy to accomplish. To grow Alum crystals I had to purchase "Alum" at the grocery store in the spice isle. I then mixed the powder with warm water and let it sit overnight. In the morning you can see a substantial amount of crystals growing in the bottom of the cup. 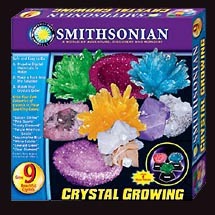 By using a bigger "seed" crystal and the rest of the alum mixture, you can let your crystal grow until it is the size you want. 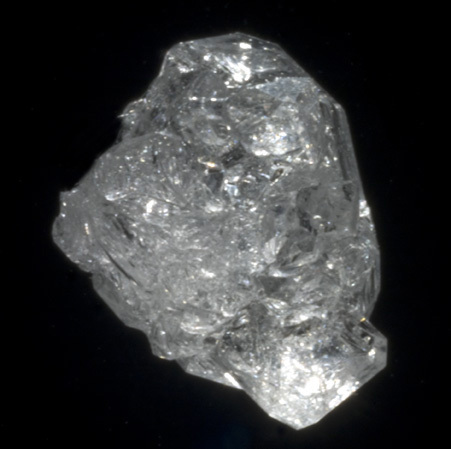 This photograph was taken of a 2 week old alum crystal and was shot using transilluminated polarized light. 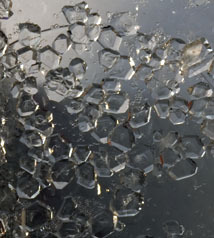 Polarized lighting was accomplished by placing the crystal between two matched polarized filters and rotating the filters to obtain the image most desired. The two main lighting techniques I used to photograph these crystals were 45 degree side light illumination and transillumination. I obtained this lighting by setting up a mini-studio with a backdrop to highlight the subject's qualities. Since this subject is multifaceted and has texture, I used 45 degree side lighting to capture the shadows and highlights of the crystal. This is obtained by placing the light source at a 45 degree angle from the subject. Transillumination literally means to cause light to pass through. 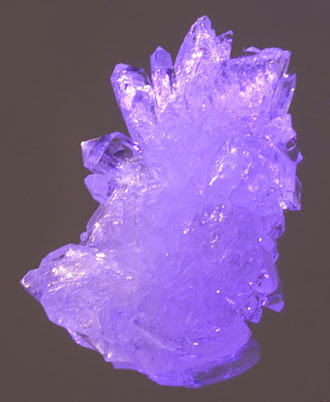 Crystals are translucent and I think are best lit by using transillumination. The setup I used for this lighting technique was obtained by using a sheet of glass elevated so the light source can be placed underneath the glass. 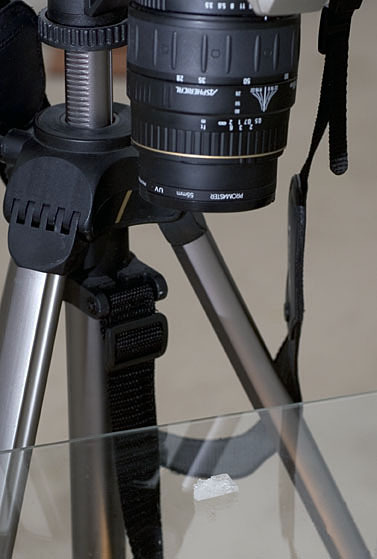 The crystal was then placed on top of the glass and the camera was attached to a tripod with the lens pointing straight down to the subject. I am currently a 3rd year student at Rochester Institute of Technology studying Biomedical Photography. This website was designed for a Photomacrography class taught by Ted Kinsman. If you have any questions or comments regarding this webpage, please contact me at bxk4335@rit.edu. Thanks for looking! Return to index of articles written by students on the 'Principles and techniques of photomacrography' course, November 2004, Biomedical Photographic Communications (BPC) program at the Rochester Institute of Technology (RIT). Article hosted on Micscape Magazine (Microscopy-UK) .